Whisper it, but Barcelona may be losing its reputation. In the last place we'd expect to see it, we got a close and exciting qualifying session today, which produced a shuffled order for tomorrow's starting grid. Had you at any point of the last 15 years or so asked an F1 fan what they associated with race weekends at the Barcelona circuit, most likely 'predictable', 'processional', possibly even 'boring' would likely have come up before long. It is a track used extensively for testing, and one that an ill-handling car can't be hustled around with any great utility. Surprise results and race orders therefore tended to be at an absolute premium. Usually a Barcelona starting grid would represent a case study of the cars evenly spaced and in the rank order of their aero efficiency. If that's still the case then we're in for a real treat in F1 for the rest of this year. Barcelona qualifying today was tight, diverting and ever-changing right to the last, and at the end of it all plenty of drivers are facing lining up for tomorrow's race in an unaccustomed grid slot. Not even the phoney 'shadow boxing' of the early part of the final qualifying session could spoil things. It all kicked off in the final moments: Fernando Alonso first off delighted the home crowd by sticking himself at the top of the timing screens, and he was then usurped moments later by Pastor Maldonado in his Williams of all people. But then Lewis Hamilton, who'd looked by a stride the quickest thing out there all through the qualifying hour, reminded both of reality by claiming pole with a time more than half a second clear of anyone else's best. But it was an amazing job by all three: Lewis continues his excellent 2012 form wherein he looks increasingly to be back to his very best, and in so doing left his team mate Jenson Button to miss out on the top ten altogether and spend most of the time having some kind of crisis about his car's handling if his radio communications are anything to go by. And Pastor Maldonado once again demonstrated that those who deride him merely as a 'pay driver' are way wide of the mark. Further, Williams has been threatening this sort of performance all season, the FW34 is clearly a fine machine which generates plenty of downforce. And as far as most of us are concerned the Grove squad's revival is not before time. I also make it the team's first front row start that wasn't rain-assisted since Monaco in 2006. And while Alonso was frank that his third place on the grid may not be totally representative, all at Maranello will be glad that they're moving in the right direction, and that their upgrades are having the desired effect shorn it seems of the previous correlation problems. But it is behind these three that the main intrigue for tomorrow's race may lie in wait. The Lotuses will line up fourth and fifth on the grid, with Romain Grosjean ahead, and yesterday the Lotuses looked clearly the strongest over a race stint. Just as in Bahrain, their fate may pivot on how quickly they can get through the field for a crack at the leader, and they're starting much higher up here than they did then. But on the flip side, Lewis looks like he won't be giving much away out front judging by his pace today. And then there are the likes of Sebastian Vettel (who starts eighth after not setting a time in the final qualifying session), Jenson Button and Mark Webber (who start 11th and 12th respectively after missing out on the top ten in another tight session) who'll be looking to improve tomorrow and will have fresh tyres in hand. 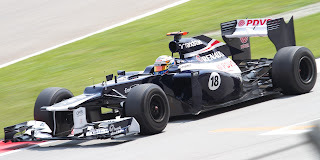 Sergio Perez who qualified in P6 also appears handily placed, the Sauber's looked as good as anything this weekend. So, the fun in qualifying could be just the thin end of the wedge. Only the brave will be confidently predicting the outcome of tomorrow's race. 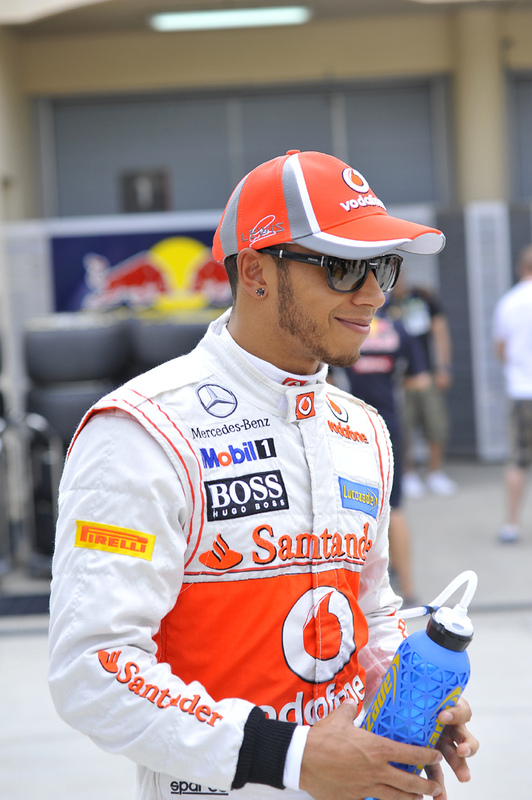 UPDATE: Lewis Hamilton loses his pole position and will start at the back. It turns out those seeking to predict the race outcome this afternoon were even braver than we thought. This is because pole man Lewis Hamilton has been relegated to start at the back of the grid for tomorrow's race. The FIA ruled that he had breached the rules in not returning to the pits after completing his final qualifying lap, as he stopped out of the track under orders from the McLaren pit wall talking about a 'technical issue'. It turned out that the 'technical issue' was there not being very much fuel left. Under Article 6.6.2 of the FIA Formula One Technical Regulations cars must to return to the pits under their own power, unless there is a very good reason for not doing so. And following a similar incident in qualifying at Canada in 2010 (ironically also involving Lewis and McLaren) it was made clear that simply not putting enough fuel in the car to complete the slowing down lap at the end of a qualifying session wouldn't be viewed as a compelling reason. Otherwise teams would simply take a third of their normal fuel level out of their cars on its final run, happy to run dry on the slowing down lap. So, it seems the breaking of the rule is pretty open and shut, but the punishment, dropping Lewis all the way to the back of the grid, appears very harsh. Something like a five-place grid drop seemed a lot more proportionate to the offence. It's got me wondering if there's more to this than is being let on currently: perhaps, as in Hungary 2007 (and in Watergate), it was the attempt to 'get away it' rather than the original offence that got them into trouble. Certainly, on the face of it, McLaren's claiming of a 'force majeure' defence which according to reports amounted to them in error not putting enough fuel in, seemed absurd. Force majeure is legally defined as something 'beyond the control of the parties'. This, on the face of it, wasn't. Was it this that rubbed the stewards up the wrong way? I suspect that there's quite a bit more to emerge from this case. And, yet again, McLaren appears to have trod on its own tail. Whatever the case, it did seem foolish for the team to sail so close to the wind on fuel levels when it was pretty clearly going to claim pole with a bit to spare. And McLaren would have been aware of this rule surely (it helped to create it, after all). As noted previously, the regularity with which McLaren drops clangers makes you wonder if there's something fundamentally wrong in how it operates. But whatever the case, we have the astonishing prospect of Pastor Maldonado in his Williams starting on pole position tomorrow (I'm told you'd have got odds of 200/1 on that before qualifying), with Fernando Alonso alongside. But it's the second row that's perhaps most likely to provide the eventual winner. The Lotuses, with their prodigious race pace, may now be in the position of it being their race to lose. But the way this weekend is going who knows what lays ahead? Do you mind if I re-post this on my blog? So long as you include a link somewhere back to my blog I'm happy for you to put it up. Surely a logical approach would see Hamilton's best lap ignored and his qualifying based on his previous slower lap. Its seems very odd that three drivers who failed to set a time in Q3 are in the top 10 but Hamilton is at the back. It will make for an interesting race but F1 is these days so manipulated and political that it should no longer be considered a sport. 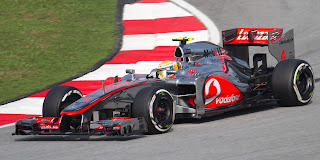 Alonso will start on the dirty side of the track and will have his mirros full with the Lotus attack. 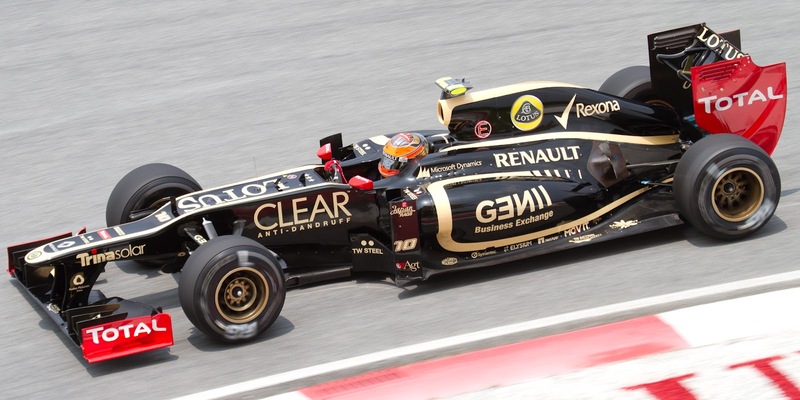 Should be interesting, hopefully Maldonado will not try to win the race at the first corner and cause a collision. Looks like we're in for a treat. Thanks Bill. Yes, on the face of it the punishment seemed very harsh given the offence. And McLaren was very quick to 'accept' the punishment as well (though you could argue it didn't have much choice), it didn't raise the merest peep of objection from what I could see. As I said it all makes you wonder if there's a bit more to this, one way or another, that we don't know about. 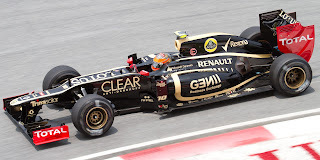 Seeing how Maldonado reacts to being on pole tomorrow will be fascinating. Thing is, he's always been quick, but also a bit error prone. How will he react to this pressure? Will he err again, or could it be that this opportunity is the making of him? I put a bet on Maldonado for pole, bookies aren't paying out though! They class Hamilton as being on pole, they base it on times and don't recognise penalties applied after the session. Having thought I'd done pretty well out of my little flutter, I discover I won nothing. Not impressed to say the least. Typical bookies - any excuse not to pay out!